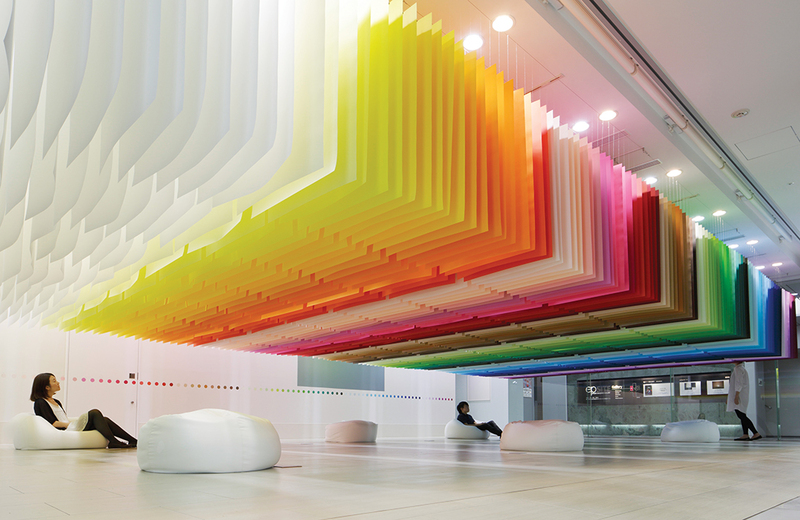 For an installation for the Japanese paper manufacturer Takeo, architect Emmanuelle Moureaux suspended 840 pieces of paper in a spectrum of 100 colors. 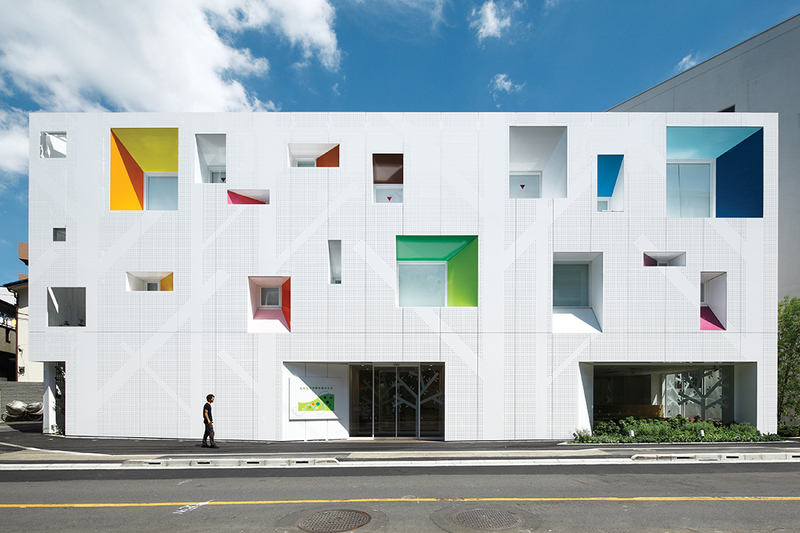 One of the four Tokyo branches Moureaux has designed for Sugamo Shinkin Bank sports 14 colorful window boxes punched into the facade. Moureaux designed a colorful installation for two Issey Miyake shops in Tokyo in 2013. 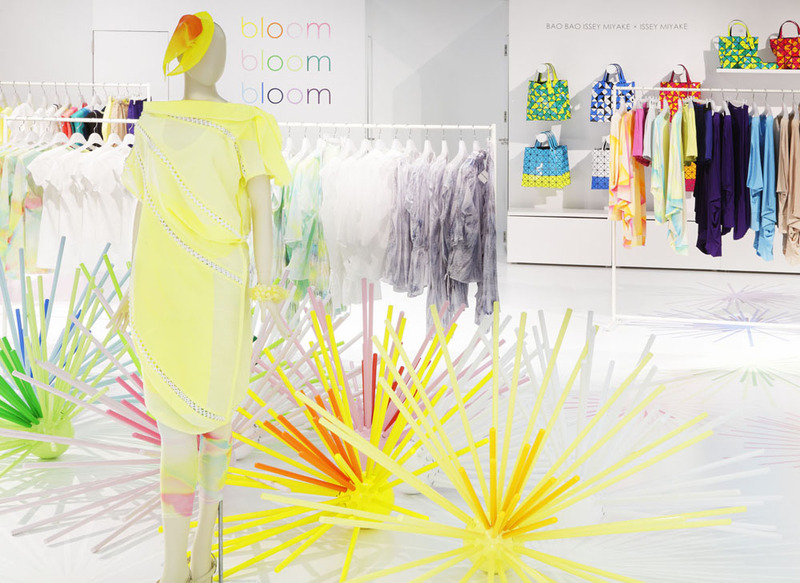 Sculptural "flowers" in bright neons gave the shop floor a dynamic energy to celebrate the launch a new collection by the Japanese fashion brand. Layers of lacquered MDF in a rainbow-bright shades make up these playful cabinets, designed by Moureaux for Schönbuch. A pop-up installation for the Shinjuku Creators Festa in Tokyo invited visitors to play a number of designer-created games using paper from Takeo. Moureaux suspended 840 pieces of paper in a spectrum of 100 colors. This whimsical table is made up of 56 acrylic sticks, embedded into a piece of transparent acrylic. Another branch of the Sugamo Shinkin Bank features 29 tall exterior poles and 19 in the entryway, blurring the boundary between indoors and outdoors. These bright textiles are a modern take on traditional Japanese "tenugui" handkerchiefs. For this colorful concept that took over 51 Uniqlo stores, starting with the brand's flagship in Ginza, Moureaux hung rows of paper strangs so that they would pick up passing breezes. Modular wooden blocks with colorful accents brighten up this glasses shop in Saitama. It is not an approach she learned at architecture school in Bordeaux, where color was treated mostly as an afterthought. But in 1995, Moureaux took a weeklong trip to Tokyo to research her graduate project and found herself immersed in a cityscape unlike any she had ever seen. Vending machines, signs, electrical wires, and glimpses of sky floated in a multilayered, multicolored panorama. The experience was an epiphany. “Tokyo was like an art piece that made you feel emotion,” she says. She moved there the following year, and seven years later, in 2003, she started her own firm.